Complementary to the core curriculum, this includes innovative and co-scholastic programmes. Its aim is to provide students with additional instruction that will help to reach their learning potential. ICTs ensure clarity of concepts and better understanding and retention. Each classroom is equipped with Digiclass, fuelled by world class content. Maths Practice is a programme designed to improve students’ conceptual understanding of maths through commonly available everyday material. This hands-on involvement encourages divergent and lateral thinking, and therefore, innovation in daily life. 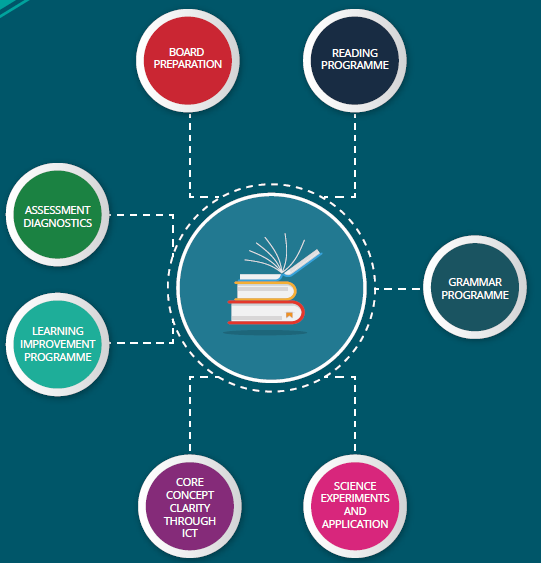 Helping both students and parents achieve a better understanding of learning needs, the Diagnostics programme identifies academic strengths and weaknesses. The school and student’s family then work together to bridge the gap. Grammar Programme uses a natural learning process to improve grammar skills. It comprises worksheets, exercises, speech activities, listening, reading and conversation to help students master the English language. Particularly aimed at students from grades 1 to 8, the Science Experiment programme comprises kits that can be made into working models. The approach is hands-on and activity-based, allowing students to acquire a deeper understanding of the subject. The Learning Improvement Programme includes Board Examination preparation for students of higher classes, especially in cases of special need. Please fill the form below to apply for transfer certificate online.